Gold Beach Guide Service is owned & operated by Gene Garner, a local professional with over 35 years of experience fishing rivers on the Southern Oregon coast. 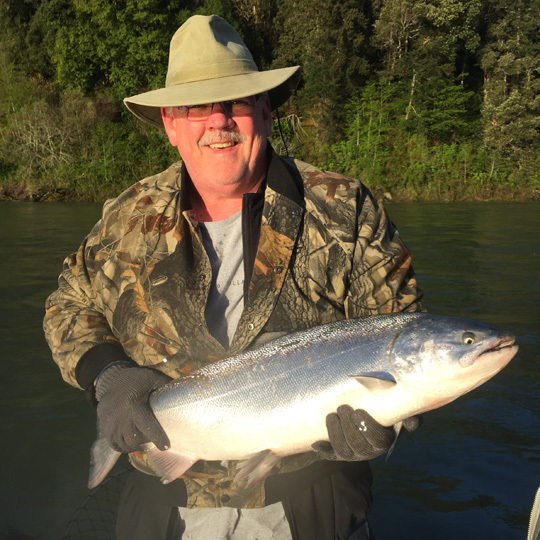 Depending on the time of year, we guide fishing trips to catch world class King (Chinook) Salmon, Coho (Silver) Salmon, or Steelhead on several of the nearby rivers. 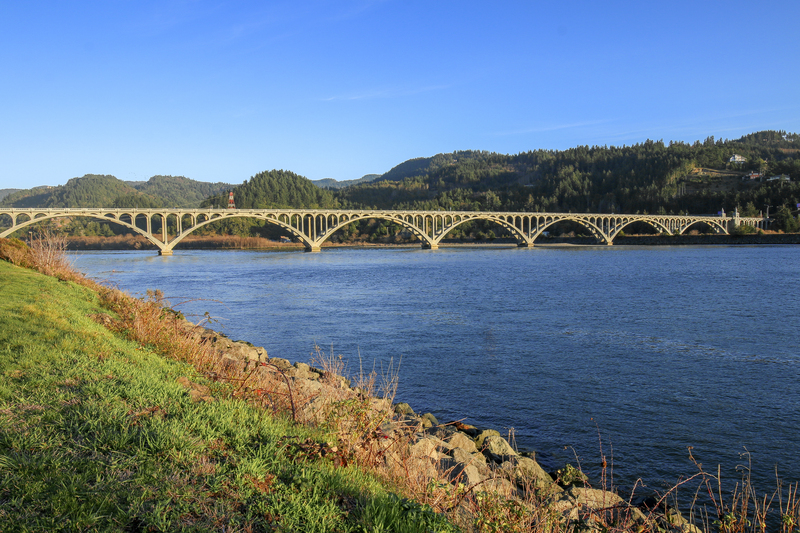 Rogue River: Located in Gold Beach, the Rogue is world famous for the best salmon runs on the west coast. Chetco River: Located in Brookings, OR. A very popular destination for winter steelhead fishing. Elk River: Located in Port Orford, OR. Only accessible by drift boat or on foot, as jet boats are not allowed. Sixes River: Located north of the Elk River, the Sixes is also a drift boat only river but with a gentler gradient than its sister. Here are some of our biggest catches from last year’s guided river trips. Remember, you can’t make our WALL OF FAME if you don’t go fishing! 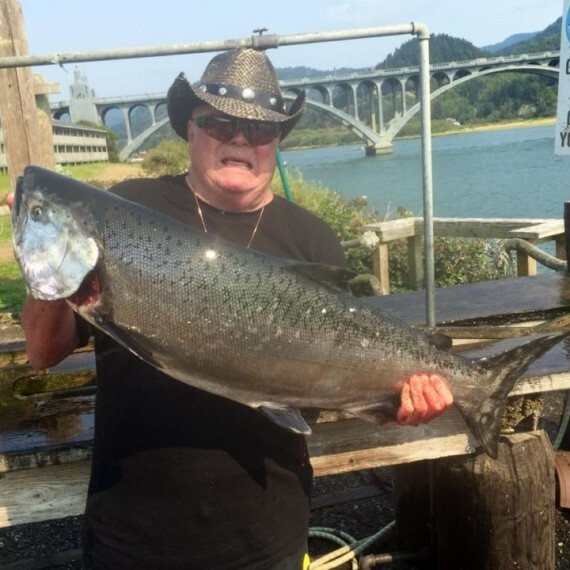 Jim caught this 35 pound Salmon in September! 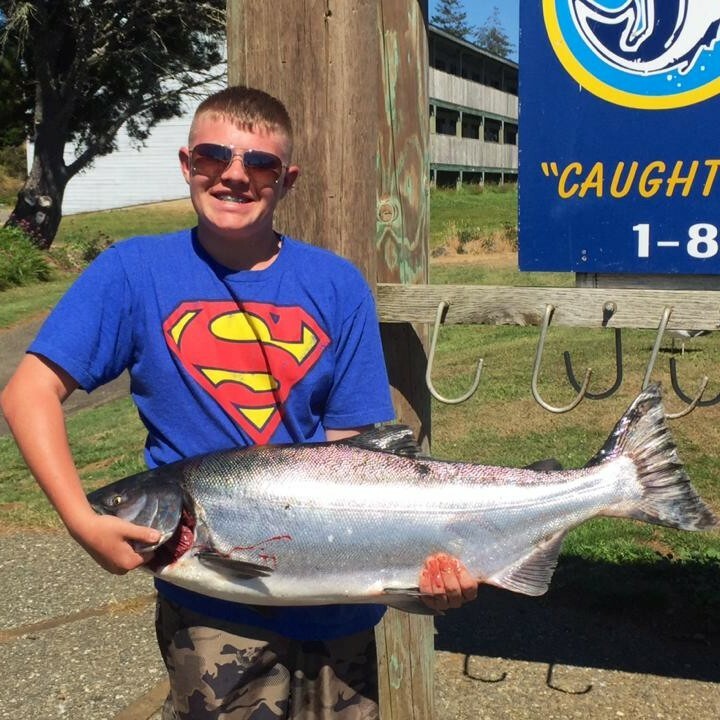 Here’s a 27 pound Chinook that Tyler caught back in July! Bring the kids fishing! ALL AGES are welcome! 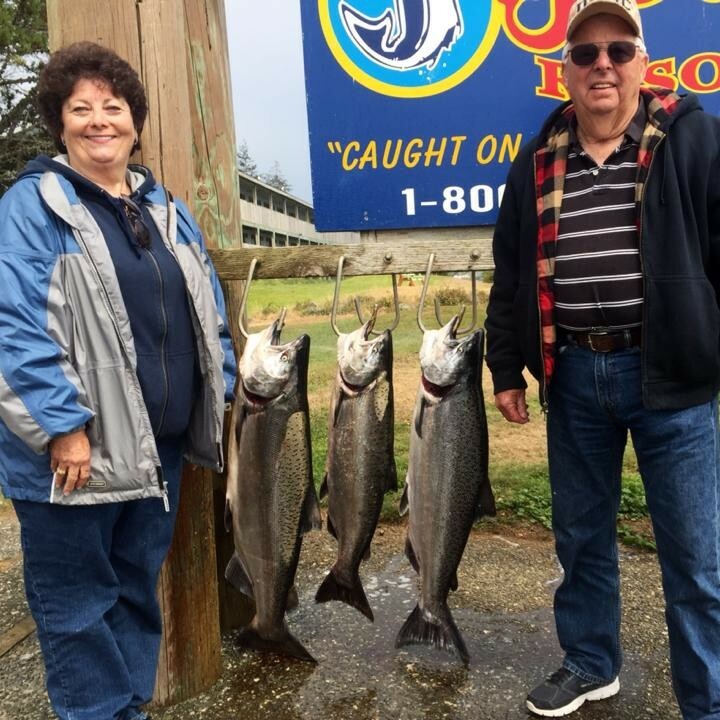 As one of Oregon’s top fishing guides, we want your trip to be as pleasant and memorable as possible! So the following items are recommended. All tackle and fishing gear will be provided – but feel free to bring your favorites if you have them. On the Southern Oregon coast, climate is always changing. Wear multiple layers to stay comfortable in any temperature. Gold Beach sees about 80 inches of rain per year, so waterproof clothing is essential! A jacket is recommended at minimum. No matter where/when we’re fishing, chances are high we will get some sun. Some polarized glasses are highly suggested! Bring a lunch, snacks, drinks- and whatever else you’ll need to get by for several hours while we wait for the big catch. Capture every moment and bit of scenery on the river. We are equipped to take a photo of you with your catch at the end of the trip. Oregon is filled with diverse nature & wildlife, many of which we’ll encounter on the outing. Make sure you don’t miss any of it! Can be purchased for annual, 1, 2, 3, or 4 day use. Order in advance through ODFW or in-person at the Rogue Outdoor Store. Tracks the salmon and steelhead that are caught daily. Order one with your license so that everything is legal. Deposits are required upon reservation. Special arrangements can be made for parties over 6 people with advanced notice. 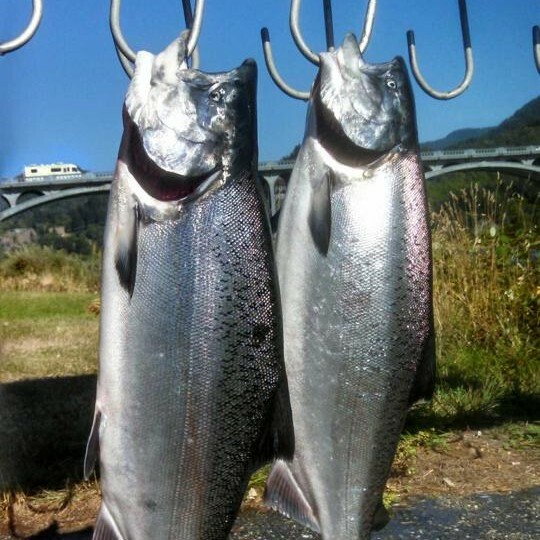 2 person minimum for guided trips on the Chetco, Elk and Sixes Rivers. Please call for availability on single parties. Ready to book your fishing trip? Or just looking for more details? Send us your information and we’ll be in touch soon! 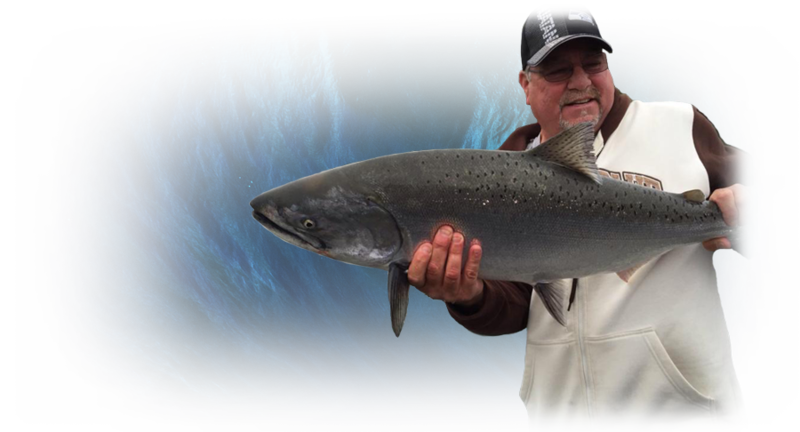 For those looking to find the best fishing experiences on the Pacific coast, only a professional guide will do. 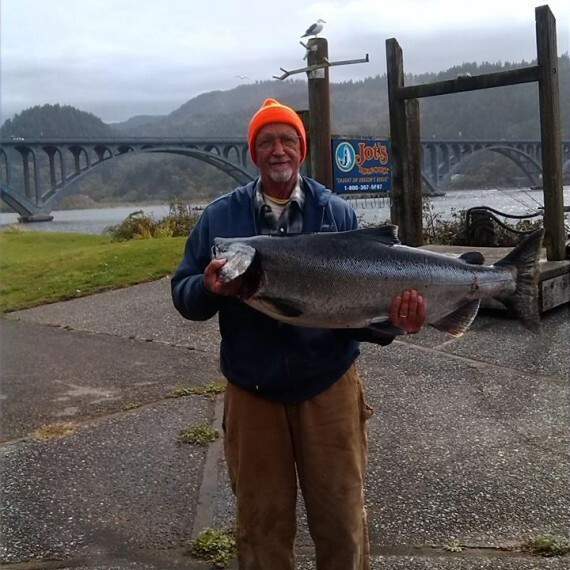 Gold Beach Guide Service has years of experience fishing in southern Oregon, so we know the best spots to catch salmon and steelhead year round. Contact GBGS for a trip you’ll never forget!